Uniquely large covered patio gives this ground-floor condo the feel of an outdoor living room. 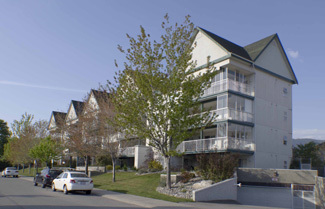 Two bedrooms, two bathrooms located a short walk from Okanagan Lake, downtown and the community center. Open floorplan with a bedroom at either end. Each of the two bedrooms and the living room have access to the 300 sq.ft. patio. The living room features a gas fireplace and there is a natural gas BBQ hook-up on the patio. Gas is included in the strata fee. Secure underground parking. Age 19+, no pets, rentals permitted. Currently tenanted, notice please.